The Orbiter ride at the Allen County Fair entertains fairgoers. LIMA — A 10-year-old girl who otherwise would have entered the fifth grade at Perry schools on Monday instead is a patient at Nationwide Children’s Hospital in Columbus. Kylie Richards began experiencing dizziness and a headache after exiting the Orbiter ride Sunday night at the Allen County Fair. Things spiraled downward from there. Her mother, Mandy Triplett, on Wednesday recounted the series of events that landed her daughter in the Columbus hospital with what she said was described by doctors as a “spinal stroke.” The young girl has exhibited no movement in her extremities since arriving at the Columbus hospital and all her family can do is hope each passing day brings improvement in her condition. Kylie’s parents took their daughter to Mercy Health-St. Rita’s Medical Center, and the child subsequently was transported to Nationwide Children’s Hospital for further evaluation and treatment. But Triplett and Kylie’s father, Keith Richards, don’t believe there was any malfunction or other abnormality surrounding the amusement attraction that the young girl rode shortly before experiencing her symptoms. “My opinion is that it was just a freak accident,” her mother said. She said the incident was not reported to fair officials or anyone associated with Poor Jack Amusements, the company that is providing midway attractions at this year’s fair. 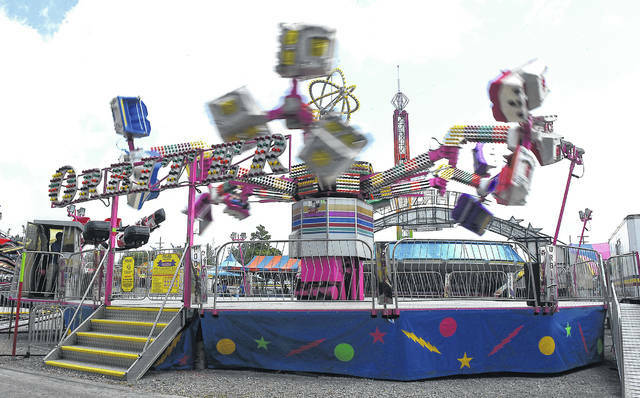 A spokesman from the Ohio Department of Agriculture’s Division of Amusement Ride and Safety said an inspector was headed to the Allen County fairgrounds Wednesday to investigate further. Representatives of the Poor Jack company could not be reached for comment. Donation jars to help the family with medical expenses have been placed at Fat Jack’s Pizza in Shawnee and both Lima locations of Daryl and Daryl’s.